The Top Search Engine Giants like Google,Bing,Baidu,Ask and Yandex have secret snooping tendencies.These Search Engines Do not Ethically Respect your Privacy and often automatically makes your Profiling Once you begin using their Services. How to Check GOOGLE Search Engine is Tracking you? then RIGHT CLICK and COPY the URL of that Site,Paste it in new tab, you will see a Very Ugly & Obnoxious LONG URL (Site Address) that does not make SENSE. But Google is TRACKING your visits and displaying advertisements from data collected from your search and click history.You can Block Tracking and Anonymize your Browsing Habit in Firefox Browser using Privacy Addons.
) 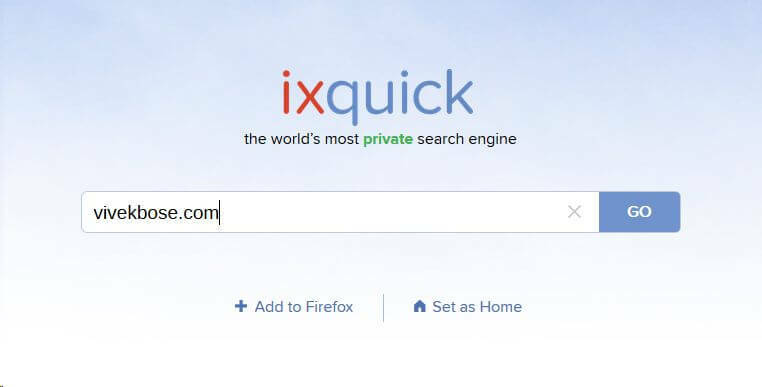 result means that five search engines agreed on the result.On July 14th 2008 Ixquick received the first European Privacy Seal from European Data Protection Supervisor Mr. Peter Hustinx. The Seal officially confirms the privacy promise and Anonymity. Qwant.com was launched in France in February 2013 after two years of research and development.Qwant’s philosophy is based on two principles: no user tracking and no filter bubble.This Search Engine displays Web Results,Realtime News and Social Results against a Search Entry Made. Note that QWANT.com COLLECTS Information if you signup on their website and use service after logging in. privatesearch.io is a metasearch engine, aggregating the results of other search engines (Bing,Yahoo,Google,DuckDuck go etc preferences can be specified in settings)while not storing information about its users.This is My favourite Anonymous Search Engine after Duck Duck Go. it is inspired by the seeks project. It provides basic privacy by mixing your queries with searches on other platforms without storing search data. Queries are made using a POST request on every browser (except chrome*). Therefore they show up in neither our logs, nor your url history. In case of Chrome* users there is an exception, privatesearch.io uses the search bar to perform GET requests. Disconnect Search is powered by DISCONNECT.com,A Major Developer of Anti Tracking Addons and Plugins.You can Search privately using your favorite search engine: Google, Yahoo, Bing and DuckDuckGo in Disconnect Search. It masks your IP address, cookies, and other personal info.Flexible Search Options from 3 Major Search Engines. Motherpipe.com is another Anonymous Search Engine that also supports Country Specific Searches from India,UK,USA,Germany and Sweden.This Search Engine is YAHOO+BING Enhanced Privacy Search Engine and Displays Ads from Yahoo,Bing Networks. So they may Track your clicks on advertisements. Gibiru provides Uncensored and Unpersonalized Anonymous Web and News Results.The SSL Certificate is Self Signed and May Generate Error While Accessing Website.Gibiru has its own robots that crawl less mainstream websites, sites that tend to promote “alternative” views from mainstream. Because Google and Bing crawl Lamestream media at infinum, Gibiru does not waste bandwidth crawling these mainstream sites however their content is still available through web search and HTTPS encrypted web search. Lukol is anonymous Search Engine that does not Offer SSL Options and it is Proxy Powered Google Search Engine and is Less Reliable than top 5 Anonymous Search Engines. PrivateLee is Another Anonymous Search Engine with Low grade TLS v1.0 SSL.Display Ads from MSN network and therefore tracking can be made on clicking ads. Oscobo is a UK-based company founded by two guys who left their corporate jobs to work towards a belief they both shared – that personal data should remain just that, personal.It is commonly called as UK’s Private Search Engine and a new entrant to Privacy Ecosystem. Hulbee.com is the first intelligent answer engine because it is based on semantic information recognition and offers users intuitive help in their search for answers with great importance to data integrity and the protection of privacy. Contrary to search engines, users at Hulbee.com don’t leave any tracks. Hulbee.com even does without countless analyses of their visitors. Their topics, IP addresses and personal information, are not stored or used for any additional business. All the servers are located in Switzerland and neither the US nor other data snoopers can get their hands on this information. Searx is a metasearch engine, inspired by the seeks project.It provides basic privacy by mixing your queries with searches on other platforms without storing search data. Queries are made using a POST request on every browser (except chrome*). Therefore they show up in neither our logs, nor your url history. In case of Chrome* users there is an exception, searx uses the search bar to perform GET requests. Searx can be added to your browser’s search bar; moreover, it can be set as the default search engine. Peekier (pronounced /’pi·ki·er/) is a new way to search the web. Peek through search results fast and securely on a search engine that respects your privacy. Found this very helpful. Thank you! Copyright © 2019 VivekBose.com. Powered by WordPress and Stargazer.